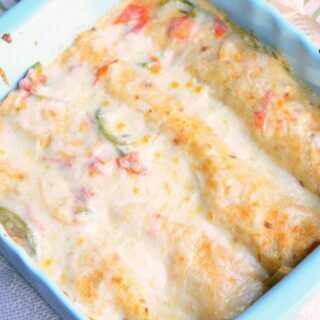 Classic dish that’s perfect for a big family dinner. 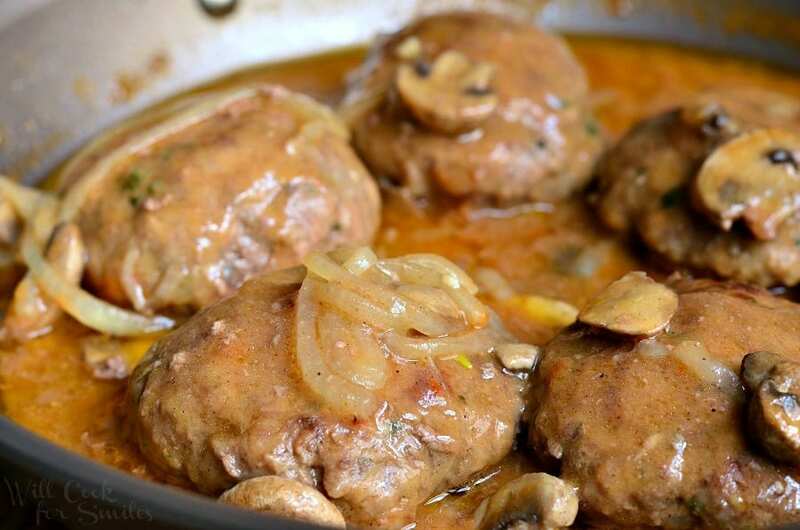 Juicy Salisbury Steaks made with mushrooms, onions and delicious gravy. Make sure to sign up for my email so you don’t miss new recipes. Salisbury Steak is a beloved classic dish and that’s why I think it would be perfect not just for serving it as weekend dinners but also during holidays. In my family, our Thanksgiving feast is always traditional but our Christmas dinner menu always varies. It doesn’t have to be turkey or ham each time, so I like to mix it up with the main meats. Beautiful part about this juicy “steak” is that it goes with so many different sides. 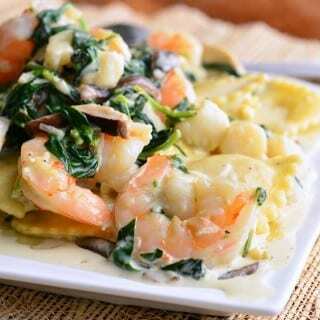 A traditional way to serve it is with mashed potatoes or pasta but really, any side will be great here. Roasted potatoes, asparagus, green beans or squash, all are great just don’t forget the dinner rolls! 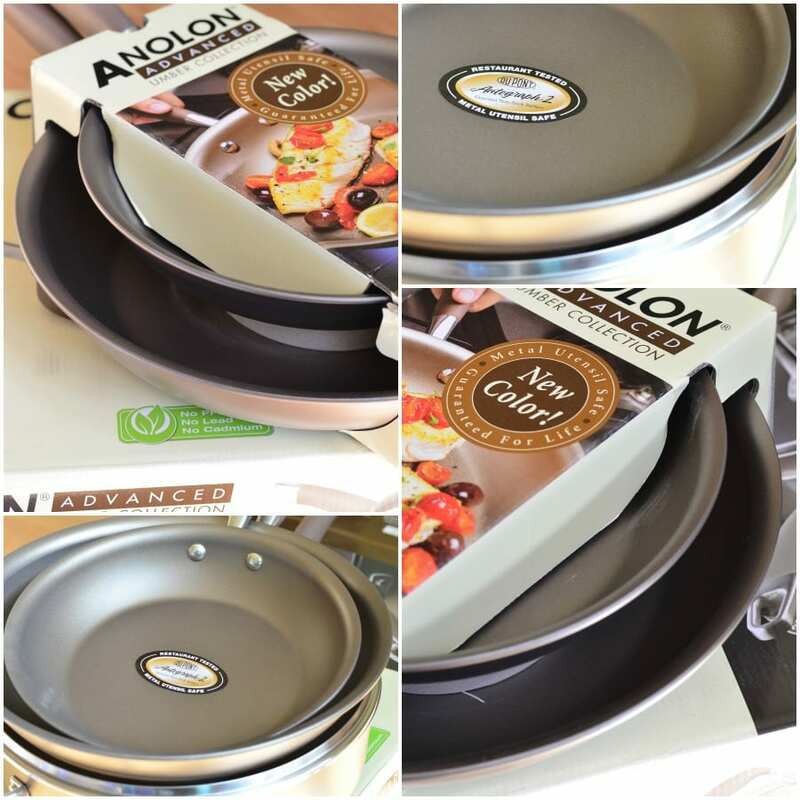 Anolon has a vast range of kitchen cookware and bakeware products. This Advanced Umber cookware gourmet collection features superior nonstick surface that is durable, easy to clean and comes in a beautiful umber color that would be perfect for the season. This cookware is actually nonstick on both, the pan interior and exterior, which is a nice plus for keeping them clean on the outside. It makes it handy for stove-to-table service. To get your very own set, you can find Anolon cookware, bakeware and kitchen accessories at nationwide stores like Macy’s, Bed Bath & Beyond, and Dillard’s. It would make for some nice holiday gifts too…hint, hint! You can learn more details about each product and exactly where to buy them on Anolon.com. Don’t forget to check out the fun holiday sweepstakes that Anolon® Gourmet Cookware and Kendall-Jackson® are running this season. You could win some nice holiday hosting gifts to help you with you holiday preparation. Enter HERE! 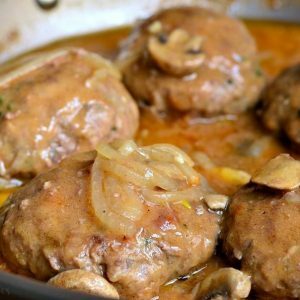 Juicy Salisbury Steaks made with mushrooms, onions and delicious gravy. In a medium mixing bowl, combine all ingredients for steak and mix very well (except four and sliced mushrooms and onions). Place flour into a wide bowl. Separate ground beef mixture into eight even balls. 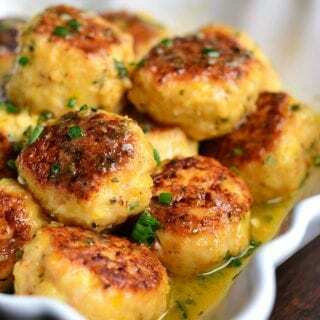 Flatten the balls of meat into patties and lightly coat with flour. Preheat oil in the large skillet, over medium heat. 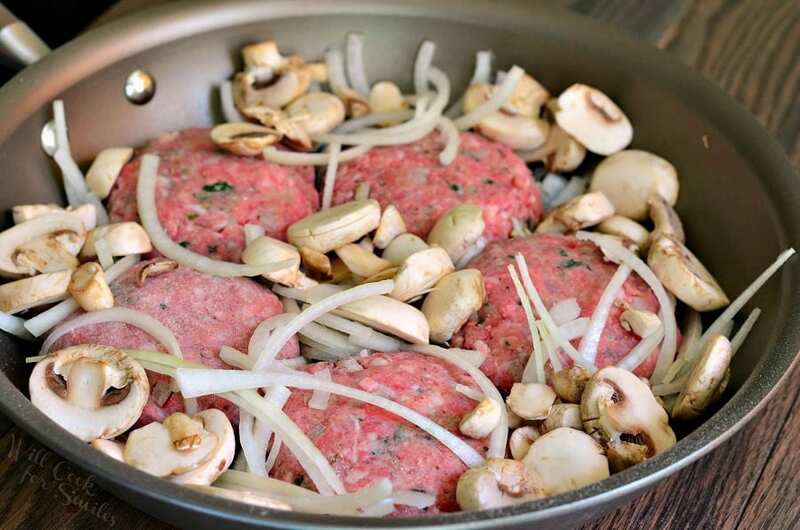 Place steak patties, sliced mushrooms, and onions into the skillet and cook for about 5 minutes on each side. 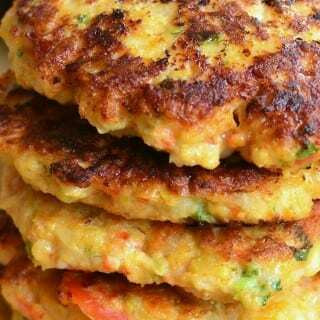 Take the patties out and set aside (just the meat patties). Add butter to the pan and once butter is melted, sprinkle flour over the top. Mix well and slowly pour in beef stock, while stirring. Add pressed garlic, tomato paste, Worcestershire sauce, thyme, salt and pepper. Mix until all smooth and evenly incorporated. 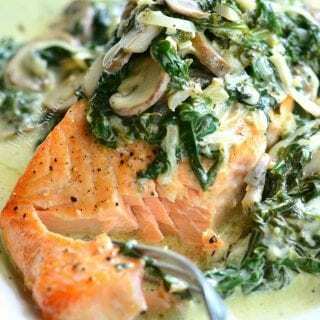 For more recipes, promotions and other detailed information, please visit Anolon Facebook, Pinterest, Blog and Instagram! This is a sponsored conversation written by me on behalf of Anolon. The opinions and text are all mine. 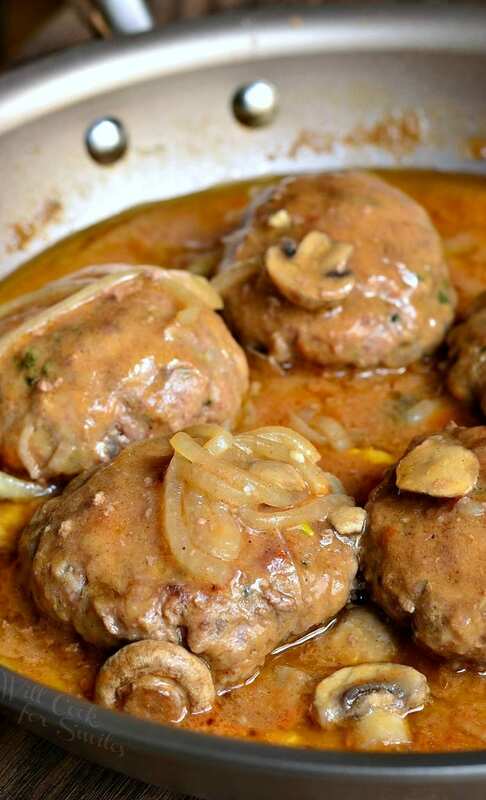 Salisbury steak does sound excellent for holiday meals. 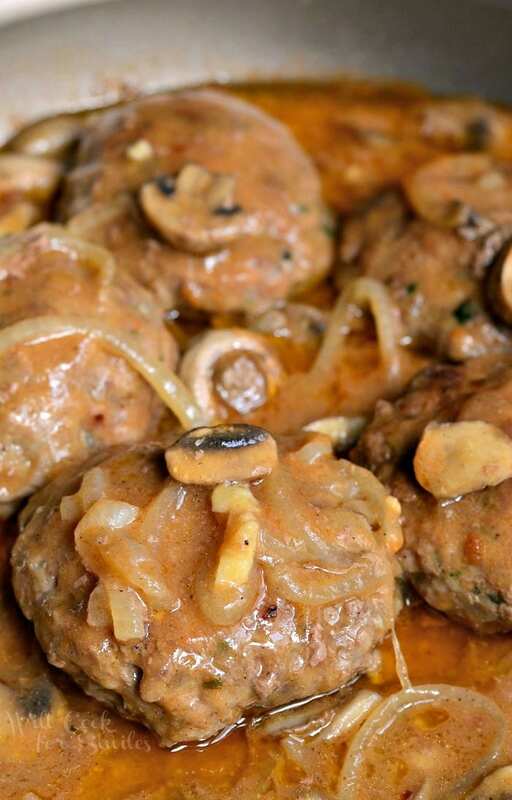 The pictures of your salisbury steak look so mouthwatering, especially with those mushrooms. Thanks for the ideas. Thank you so much, Joshua!! Thank you for the nice recipe. Have a great weekend. 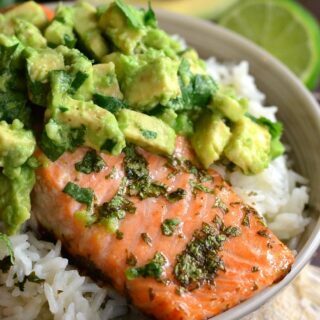 Looks delicious Lyuba! I can smell the meat cooking all the way over here! We do need new cookware and we watch our coated ones like hawks. No-one gets near them with metal. Great photos of the dish!! Made it tonight for dinner. Used ground venison and pork but otherwise followed the recipe. The sauce is excellent but should reduce without the lid for a few minutes. Maybe cover and simmer for ten minutes then remove lid and simmer another five or so.